Yet again a long time running since I’ve mustered a blog entry. I can tell you all seriousness… life has been a whirlwind in these last couple of weeks. With in just days of my last posting, SBJ was laid off. A shock I was totally not prepared for, but somehow everything seems ok right now. Basically the co. decided that his position would be restructured and that if he reapplied for the newly constructed position he would be paid hourly vs. salary. Or he could take the severance package and walk. He opted for the severance package and is in the market for another job. There have been a couple interviews, lots of resumes going out, one offer on the table that is currently in negotiation. So, I guess we will have sit tight and see what pans out. In the mean time he is getting his resume out there and hopefully other things will surface soon. Just a day after he was laid off, my very strong suspicion was well comfirmed. We are pregnant! Certainly the fabulous with the not-so-much-so. But we are just so extremely excited! It’s wonderful news. Of course, I never fully trust this theory till I actually see the first ultrasound and the little pitter-patter of the baby’s heart beat. I mean, who’s to trust this little stick you pee on that just randomly selects your are pregnant. It’s really bizzare. 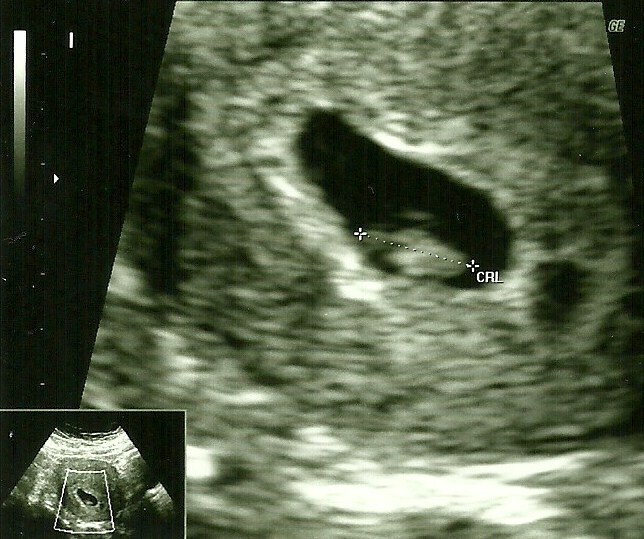 At any rate, today was our first appointment and first ultrasound! We saw a very strong heart beat and they tech was even able to detect the beat pattern. It was so cool. 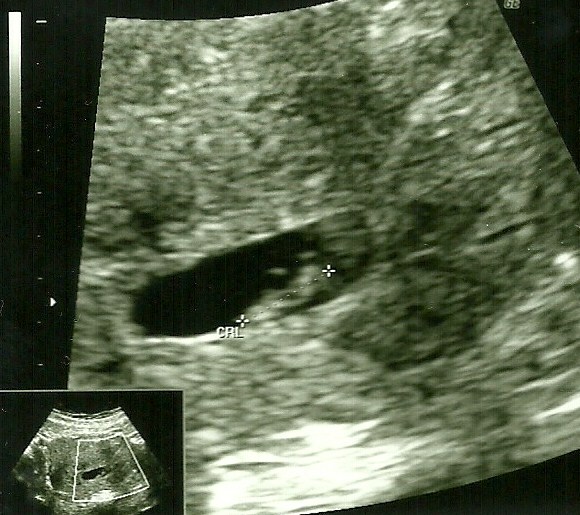 She measured us at about 7 weeks 2 days, and so we are due just around Sept. 22nd. So awesome! It really brings it all to reality seeing and experiencing all that! We are all so excited! So the end-ish part of January we had a ton going on. I had my au pair meeting and parents social, as well as an orientation to conduct with a new au pair that just came to town. We have trivia mania and girls club going on, and that’s been going pretty well. I feel really bummed to be missing all of D’s girls club though. That’s been kinda hard to send her off into the other room and miss out on all of her fun activities. And trivia has been a learning process for sure. I feel like at this point we’ve found a pretty good groove and the really fun part of the class is about to kick off. The kids have spent the last 4 weeks collecting trivia, and the next 4 will be the game building. So that will be a ton of creative fun. D had a girl scouts field trip to this cool bowling alley open in 1918! It was the coolest lil’ place I’ve seen and can’t believe the history still preserved there. That was a super fun event. That same week we made it out to Des Plaines for the homeschool classes they have out there. That month’s class was on fur trading which was really quite interesting. K’s started up is Princess Bride class and that’s been going pretty well. The first week he was certainly nervous being the ‘big kid class’. We did ask to push him up to the 9 years and up class, and so he has big shoes to fill if he was going to give this a whirl. He’s doing fabulously. The second week he kinda had a minor freak out the night after class. He was a lil’ overwhelmed with his role and felt that kids may be laughing at him in class. But having gone through the script with him and having watched the movie with him has calmed his nerves quite a bit. He seems quite excited now to get back to class and partake. He feels much more confident and will really do a fabulous job I am sure. D and S really seem to love the Fri art class as well. They are enjoying working together and doing there thing. S especially has taken to it more than I would have pressumed. I suppose I just did not know what to expect with him. D just loves art, so this is totally her thing. S has really enjoyed the class and just encourages his desire to be the “big kid” like the rest of ’em. He definitely does not want any preferential treatment! He’s one funny joe. K took part in a science class at Emily Oaks which he really seemed to love. I think I could have easily signed him up for the whole session he took to it quite a bit. He had a few more to attend, but at sporatic times. R and I did a childcare fair at the Skokie Library which I kinda thought was going to be great, and it really did not turn out that way at all. I think we only gave away like 4 brochures and not a single was really very interested. Open gym has been sort of not been so great. K is not loving it due to a certain peer in the group and some of the games that come up during the time there. He’s feeling like they are really unfair and unwanted games and they really cross the lines of personal space and comfortability. That’s been a tough road in our home b/c this issue affects him a great deal. He’s a sensitive soul who really wants to do right by others and expects others to be the same to him. So when this type of thing is going on, it’s distraughting to him. I feel for him real bad. It’s hard to feel his hurt and try to help him through it, but also preping him for different personalities he will eventually run into in life. Talk about life lessons there! Of course can’t forget to mention my birthday! It was a nice weekend for me. Mom cooked us a nice dinner one night and SBJ cooked for me the next night. In between, lots of spoilage and and kindness makes for a fabulous b-day weekend! This last week has felt like a blur. I’ve been dying to get to today to see this little munchkin growing in me, and trying to keep the unemployment anxiety to the way-side…. and then yesterday, in the midst of me making my bi-weekly waffle marathon batch and listening to the lovely giggles from kiddos in the other room, I get a call from my father’s fiance that he’s landed in the ER. Yipes…. what a day. So, he had come back from Florida quite sick. He assumes this is the flu. But 9-10 days later he’s still feeling quite crappy and the abdominable pain is quite bad. He’s not shaking it, so he goes to primary care dr. saying he thinks this could be swine flu. Dr. checks him out and immediately after an ekg decides there are signs of a possible heart attack (recovering from what could have been), and sends him to the ER. He has a-fib and they feel this is just not regular. They get him all hooked up and start meds, keep track, run tests. All tests come back normal. No signs of heart attack, nor ever having one. They admit him. He is still having pretty bad abdominable pain and I, for one, can’t figure out why this is still not the focus. Yes, I agree they should track the heart, but from what these test are showing…. shouldn’t we be looking at what the cause of this abdomin stuff is (that then could be causing the a-fib!)? So I leave him last night. Great news is… not the heart. Bad news… they are keeping him and really don’t seem to have any clue as to what they are doing, nor what they are looking for. Today’s dr’s appt for us and lil’ munchkin took us the whole day so I have not been out to see him. There is nothing more serious than a call like that that will send you into a whirlwind of emotions, and set priorities straight. Wow…. what an experience. Maybe I can delve into that more later when I can more clearly grabble my thoughts. Ah… so K’s got princess bride again tomorrow, D and S have art, need to get some stuff done…. we are leaving town this Sunday! I was not sure this would happen after all, but things seem to be OK and we can reimburse this with my work, so we are taking advantage and going to the waterpark retreat for a full week. We are super excited and time is ticking till we hit the road. This week flew by and not much has been done to get me, personally, out the door, let alone the children I am packing for! ; ) But all will work out just fine. As long as we have our suits, we’re good to go. We have a room with a kitchen which I am SO happy about. I feel that’s the hardest part of being away from home is eating right and not feeling like crap b/c of it. So I’m psyched that we will have a kitchen and just be having a ton of swimming fun, and meeting some pretty cool unschoolin’ families from around the country! Yea!